The N1K2-J Shiden-Kai is a Rank IV Japanese fighter with a battle rating of 5.7 (AB), 6.3 (RB), and 6.0 (SB). It was in the game since the start of the Open Beta Test prior to Update 1.29. The N1K2-J is a versatile plane that has its great acceleration and rate of climb as the main advantage. It lacks the impressive low-speed manoeuvrability of its preceding plane in the Japanese research tree, but it can still turn against most of its fighter opposition and win the engagement. 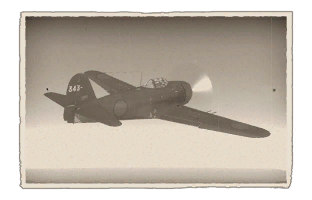 The N1K2-J's battle rating presents the potential challenge of flying against fighter jets, against which N1K pilots will have to use their high sustained rate of climb, not to be left low and vulnerable against faster enemies, as well as to use their turning ability far superior to that of the average jet. 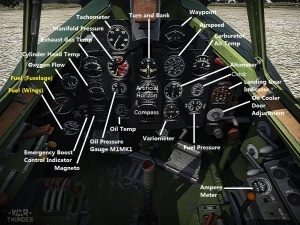 The N1K2-J can carry one of the following additional load outs, under the wings. The rockets were designed for anti-air usage versus bombers, however they are quite inaccurate and only one salvo can be fired in RB/SB. Make sure to select a detonation range before spawning in. Feel free to experiment, 300-700 m are common values. The bigger 250 kg bombs are useful in long enduring games, were few players are left and victory is determined by the last ground units. Ignore the 60 kg, your cannons will do more damage in the long run. Cockpit feature good all around visibility. The quite high mounted gun-sight allows for good sight in deflection shots, if a bit of rudder and aileron are applied. Top speed and acceleration is an issue with stock aircraft. Compressor and New Engine greatly help. Having access to Offensive 20 mm belts is helpful for gaining options of ammunition types. Kawanishi Shiden-Kai Model 21, Kawanishi N1K2-J (code name ""George"") Marine Interceptor-Fighter. A single-seat, all-metal monoplane fighter with a closed canopy. The ""Shiden"" holds a unique place in the history of airplane construction. This land-based interceptor was based on the N1K1, which had been designed to support amphibious operations. The first prototype N1K1 ""Kyofu"" (""Mighty Wind"") was flown on May 6, 1942, and mass production began in May of 1943. However, when the first seaplanes started to arrive on the front, the situation in the Pacific theater had changed so that this type of plane was simply no longer needed. Therefore, a land version project of the fighter was developed as a private initiative, based on the Kyofu. Originally it was planned that the only distinction between the two planes was that the Shiden-Kai would have retractable landing gear instead of floats, but it was quickly decided that the engine should be replaced with a more powerful alternative. A four-bladed propeller with a diameter of 3.3 meters was selected for the plane. Such a large propeller size, along with the mid-wing aerodynamic design, forced the plane to be fitted with elongated, telescoping landing gear struts which folded during retraction. The land-based version made its first flight on December 12, 1942. The prototype's private designation was the X1, and in mass production its designation became N1K1-J ""Shiden"" (""Purple Lightning""). Production began in August of 1943. The new fighter proved to be an excellent interceptor. However, its operation was complicated by the frequent failure of its engine, the Homare 21, the complex design of its chassis, and its ineffective brakes. Consequently, the number of the N1K1-J's non-combat losses was very high. The next model of the Shiden was designed to eliminate these shortcomings. The aircraft's redesign began simultaneously with the N1K1-J's military trials. The N1K2-J's first flight was made on December 31, 1943. The production model was designated the Shiden-Kai (""Purple Lightning Improved"") Model 21 Marine Fighter-Interceptor. The new model, like its predecessor, featured a 14-cylinder air-cooled radial engine, the Nakajima Homare 21 NK9H, with a takeoff power of 1820 hp. It also retained the basic wing construction and armament of the N1K1-J. 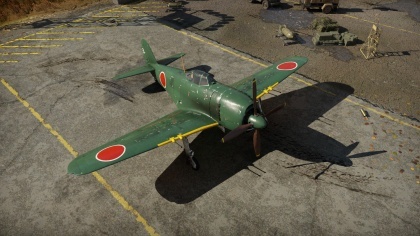 However, the Shiden-Kai was really a new plane. During the planning phase, special attention was given to ensuring ease of production and, at least to some extent, the use of readily available materials. The Shiden-Kai, unlike its predecessor, had a low-wing design which allowed the use of conventional landing gear. The new design was finally rid of the N1K1-J's main operational problems. The shape of the fuselage was completely changed and somewhat lengthened, and the vertical tail fin was completely redesigned. The empty weight of the aircraft was decreased by 240 kilograms. The N1K2-J was armed with 4 Type 99 Model 2 20mm wing-mounted cannons. The inner pair held 200 rounds of ammunition each and the outer held 250 each (900 rounds total). On the two pylons suspended underneath its wings, the aircraft could carry two 250-kg type 98 or two 60-kg type 97 bombs. Or, it could carry unguided 60-kg No.27 rockets. In addition, an extra 400-liter fuel tank could be installed under the fuselage. Because its center of gravity was towards the plane's rear, the N1K2-J was somewhat difficult to control, and was usually flown by experienced pilots (especially former Zero pilots) after they underwent retraining. This page was last edited on 19 March 2019, at 14:54.